‘Reading by Numbers: Recalibrating the Literary Field’ explores the critical potential of digital and quantitative methods for producing new knowledge about literary and cultural history. ‘Reading by Numbers: Recalibrating the Literary Field’ proposes and demonstrates a new digital approach to literary history. Drawing on bibliographical information on the Australian novel in the AustLit database, the book addresses debates and issues in literary studies through a method that combines book history’s pragmatic approach to literary data with the digital humanities’ idea of computer modelling as an experimental and iterative practice. As well as showcasing this method, the case studies in ‘Reading by Numbers’ provide a revised history of the Australian novel, focusing on the nineteenth century and the decades since the end of the Second World War, and engaging with a range of themes including literary and cultural value, authorship, gender, genre and the transnational circulation of fiction. The book’s findings challenge established arguments in Australian literary studies, book history, feminism and gender studies, while presenting innovative ways of understanding literature, publishing, authorship and reading, and the relationships between them. More broadly, by demonstrating critical ways in which the growing number of digital archives in the humanities can be mined, modelled and visualised, ‘Reading by Numbers’ offers new directions and scope for digital humanities research. 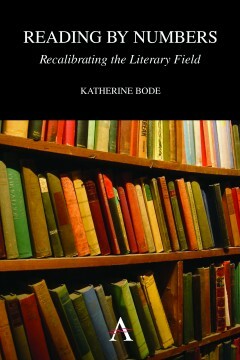 Katherine Bode is Head of the Digital Humanities Hub at the Australian National University, Canberra, Australia.